Last week we asked TCM readers about their interest in adding major appliances to truck campers. The response was swift, and about as passionate as anything we have ever asked. This is one question of the week that everyone will enjoy reading. Personally, I agree with those who say major appliances would require maintenance and repairs that would – at best – distract from the enjoyment of truck camping. Over the past decade we have experienced refrigerator, water heater, and battery problems that essentially shut-down our truck camping until they were handled. Thankfully those frustrating situations are few and far between, but breakdowns and maintenance should be top of mind when considering any additions to a truck camper. It can be challenging enough keeping up with the camper’s seals and various systems installed at the factory. A broken wine cooler? No thanks! Perhaps the one appliance that seems to make the most sense is the addition of a 12-volt compressor refrigerator-freezer. We have met a number of truck camper owners who keep a 12-volt refrigerator-freezer in their truck. One reader suggests putting one under a dinette seat. That’s a neat idea, especially if that space isn’t well utilized. “Absolutely not. I have a large two-slide camper. Even at that, the only additional appliance I have is a Wonderwash machine. It is only 16″ x 12″ x 12″, weighs 5 ½ pounds, and works off bicep-power. The laundry detergent, clothesline, and clothespins store inside it, and it easily tucks into our basement storage area. We wear lightweight, quick dry fabrics so we don’t have to use a laundromat except for sheets and towels on extended trips. “We would love to have more freezer space built in. On our last trip to Alaska (with our fifth wheel) we bought a 3.5 cubic foot freezer, installed it in a closet in the bedroom, and brought home 75 pounds of delicious salmon and halibut. We plugged it into an inverter and ran it off the truck batteries while moving, and used shore power when available. “Absolutely not. That might be the best thing for the Class A folks who camp in cement driveways, plug into shore power, watch TV, take the golf cart to get the 4:00pm special steak dinner and then play bingo all night. 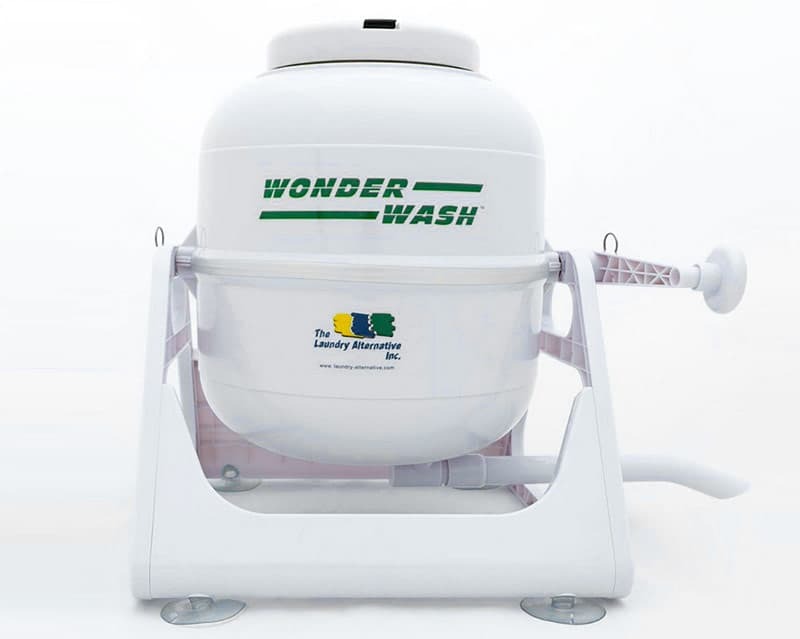 “I would absolutely want a washing machine in my truck camper, and do! As my wife and I embarked on our two year cross county trip to see all 49 states, one thing I did not want to do is have wash day. 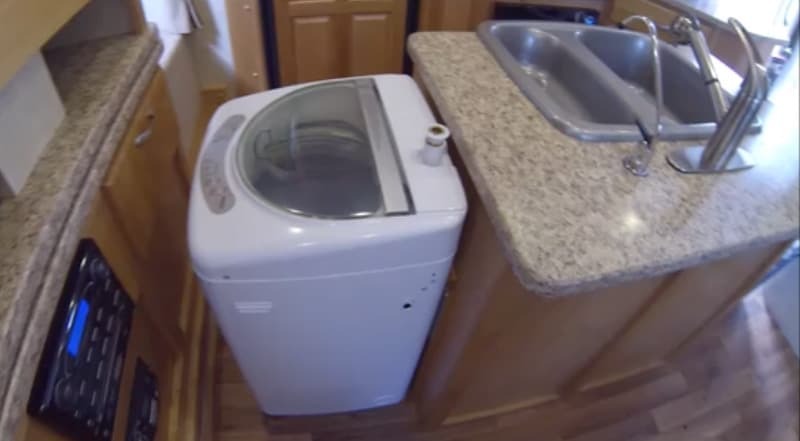 So, I installed a Haier portable washing machine, mounted to the side of my island, and it has been fantastic!